These fried mashed yet crispy crunchy potato ball is a great snack or appetizer for the full family. 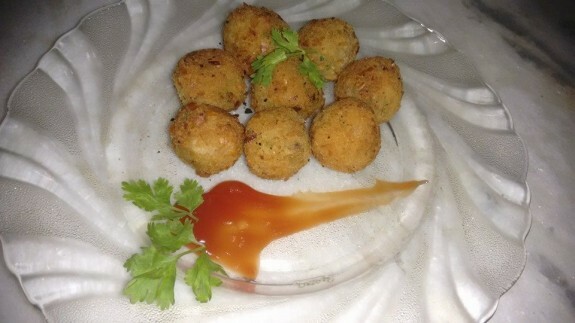 Give the taste of home with this spicy loaded mashed potato balls. 1. Take a large bowl and combine mashed potatoes, cheddar cheese, green chilies chopped, paprika, parmesan, garlic chopped, salt and pepper. Mix all the ingredients well. Now use your hands and take small portion of the mixture and roll it into 1 inch ball. Repeat the same thing with the rest of the mixture to make balls. 2. In a small bowl add corn flour, salt and little water t make a smooth paste/batter. 3. Now dip each ball in the batter and then dredge it in the breadcrumbs. 4. Heat oil in a pan and drop each ball on it. Fry 5 to 6 balls at a time not more than this. Cook the potato balls until it golden and crispy. 5. Transfer it to a plate and serve it hot.